↑ 1.0 1.1 "Asian Development Bank and Myanmar: Fact Sheet". Asian Development Bank. 30 April 2012. http://www.adb.org/Documents/Fact_Sheets/MYA.pdf। আহৰণ কৰা হৈছে: 2012-11-20. ↑ "The World Factbook". Cia.gov. https://www.cia.gov/library/publications/the-world-factbook/rankorder/2119rank.html?countryName=Burma&countryCode=bm&regionCode=eas&rank=24#bm। আহৰণ কৰা হৈছে: 2013-07-06. ↑ 3.0 3.1 3.2 3.3 "Burma (Myanmar)". International Monetary Fund. http://www.imf.org/external/pubs/ft/weo/2013/01/weodata/weorept.aspx?sy=2011&ey=2013&scsm=1&ssd=1&sort=country&ds=.&br=1&pr1.x=55&pr1.y=18&c=518&s=NGDPD%2CNGDPDPC%2CPPPGDP%2CPPPPC%2CLP&grp=0&a=। আহৰণ কৰা হৈছে: April 2013. ↑ Ammon, Ulrich (2004). Sociolinguistics: An International Handbook of the Science of Language and Society. Volume 3/3 (2nd সম্পাদনা). Walter de Gruyter. পৃষ্ঠা. 2012. ISBN 3-11-018418-4. http://books.google.com/?id=LMZm0w0k1c4C&pg=PA2012। আহৰণ কৰা হৈছে: 23 May 2013. ↑ "Burma". Hrw.org. http://www.hrw.org/burma। আহৰণ কৰা হৈছে: 2013-07-06. ↑ "Myanmar Human Rights | Amnesty International USA". Amnestyusa.org. http://www.amnestyusa.org/our-work/countries/asia-and-the-pacific/myanmar। আহৰণ কৰা হৈছে: 2013-07-06. ↑ "World Report 2012: Burma | Human Rights Watch". Hrw.org. http://www.hrw.org/world-report-2012/world-report-2012-burma। আহৰণ কৰা হৈছে: 2013-07-06. ↑ Aamer Madhani (16 November 2012). "Obama administration eases Burma sanctions before visit". USA Today. http://www.usatoday.com/story/theoval/2012/11/16/obama-lifts-sanctions-burma-visit/1710253/। আহৰণ কৰা হৈছে: 15 May 2013. ↑ Thomas Fuller; Paul Geitner (23 April 2012). "European Union Suspends Most Myanmar Sanctions". The New York Times. http://www.nytimes.com/2012/04/24/world/asia/eu-suspends-sanctions-on-myanmar.html. ↑ 10.0 10.1 "Burma". The World Factbook. Central Intelligence Agency. https://www.cia.gov/library/publications/the-world-factbook/geos/bm.html। আহৰণ কৰা হৈছে: 18 November 2012. ↑ "Rights group accuses Myanmar of 'ethnic cleansing'". CNN.com. http://www.cnn.com/2013/04/22/world/asia/myanmar-rohingya-report। আহৰণ কৰা হৈছে: 2013-07-06. ↑ Phil Robertson, deputy Asia director (2013-04-22). "Burma: End ‘Ethnic Cleansing’ of Rohingya Muslims | Human Rights Watch". Hrw.org. http://www.hrw.org/news/2013/04/22/burma-end-ethnic-cleansing-rohingya-muslims। আহৰণ কৰা হৈছে: 2013-07-06. ↑ Houtman, Gustaaf (1999). Mental culture in Burmese crisis politics. ILCAA Study of Languages and Cultures of Asia and Africa Monograph Series No. 33. Institute for the Study of Languages and Cultures of Asia and Africa. পৃষ্ঠা. 43–47. ISBN 978-4-87297-748-6. http://books.google.co.uk/books?id=bV3shLzx0B4C&lpg=PP1&dq=mental%20culture%20in%20burmese%20crisis%20politics&hl=it&pg=PR1#v=onepage&q=myanmar&f=false. ↑ Steinberg, David I. (February 2002). Burma: The State of Myanmar. Georgetown University Press. পৃষ্ঠা. xi. ↑ "Government of the Union of Burma". http://www.ncgub.net/। আহৰণ কৰা হৈছে: 3 May 2012. ↑ 16.0 16.1 Dittmer, Lowell (2010). Burma Or Myanmar? The Struggle for National Identity. World Scientific. পৃষ্ঠা. 2. http://books.google.co.uk/books?id=aoHP2Q2I1p4C&lpg=PA103&ots=C9AfQULR5Q&dq=9789814313643&pg=PA2. ↑ "Burma or Myanmar? Obama calls it both on visit" (News and blogging). Asian Correspondent. Associated Press (Bristol, England: Hybrid News Limited). 19 November 2012. http://asiancorrespondent.com/92211/burma-or-myanmar-obama-calls-it-both-on-visit//। আহৰণ কৰা হৈছে: 19 November 2012. "Yangon, Burma (AP) — Officially at least, America still calls this Southeast Asian nation Burma, the favored appellation of dissidents and pro-democracy activists who opposed the former military junta's move to summarily change its name 23 years ago." ↑ "Hosting Burma’s Leader, Obama Repeatedly Calls the Country ‘Myanmar’". CNS News. 21 May 2013. http://cnsnews.com/news/article/hosting-burma-s-leader-obama-repeatedly-calls-country-myanmar। আহৰণ কৰা হৈছে: 30 July 2013. ↑ "Should it be Burma or Myanmar?". BBC News. 26 September 2007. http://news.bbc.co.uk/2/hi/uk_news/magazine/7013943.stm। আহৰণ কৰা হৈছে: 2 August 2013. ↑ "Burma vs. Myanmar: What's in a Name". DW. 1 September 2007. http://www.dw.de/burma-vs-myanmar-whats-in-a-name/a-2804762। আহৰণ কৰা হৈছে: 2 August 2013. ↑ Mudditt, Jassica (19 November 2012). "Burma or Myanmar: Will the US make the switch?". http://www.mmtimes.com/index.php/special-features/153-sanctions-to-sucess/3187-burma-or-myanmar-will-the-us-make-the-switch.html। আহৰণ কৰা হৈছে: 2 August 2013. ↑ "Myanmar country brief". http://www.dfat.gov.au/geo/myanmar/myanmar_brief.html। আহৰণ কৰা হৈছে: 30 July 2013. ↑ "Sala de Imprensa: Situação em Mianmar". Institutional website (Itamaraty). 27 September 2007. http://www.itamaraty.gov.br/sala-de-imprensa/notas-a-imprensa/2007/09/27/situacao-em-mianmar/। আহৰণ কৰা হৈছে: 2 April 2012. ↑ Dougald JW O'Reilly (2007). 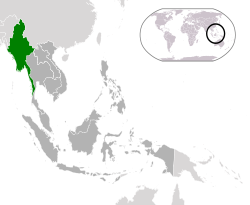 Early civilizations of Southeast Asia. প্ৰকাশক United Kingdom: Altamira Press. ISBN 0-7591-0279-1.